I am a huge fan of Care Bears, they were one of my favourite toys as a child and I loved the movie. They are one of the toys I have fond memories of that has carried through my childhood and I can share with my little ones. Plus, Care Bears are not just for girls, my boys both had Care Bears over the years. They are cute and cuddly. Care Bears have launched a campaign to which is about Take Care Of Yourself. This is something that I don’t do often enough and was delighted to receive this care package from Flair with their new range. How cute is it? I may have squealed a little, ok a lot! 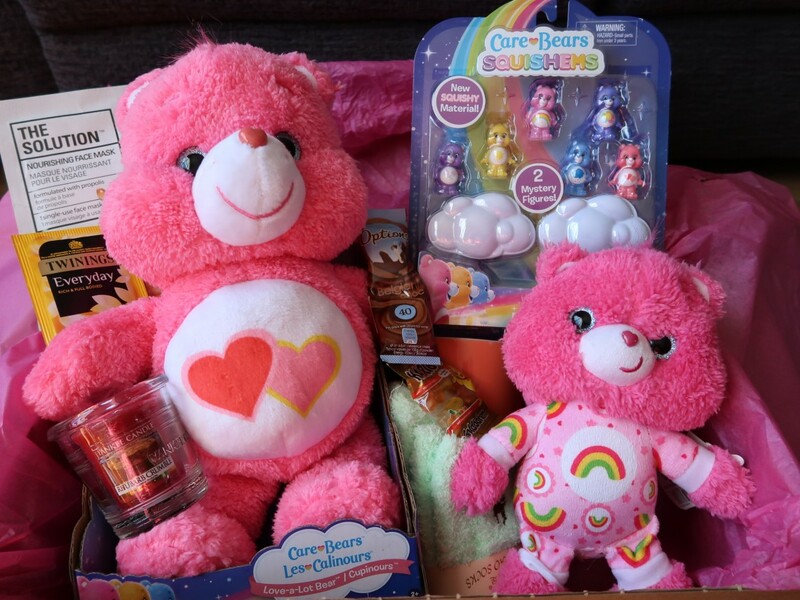 I received the Love-A-Lot Care Bear range which is great as pink is one of Aria and my favourite colour and Love-A-Lot was always one of the sweetest Care Bears. She spreads love and cheer through all those around her, especially in Care-A-Lot. In the care package with received hot chocolate, a mug, some sweets, a candle, holder, face mask, fluffy and the Care Bear items. I have been feeling poorly this week, so they were a welcomed edition. Again, how cute are they? 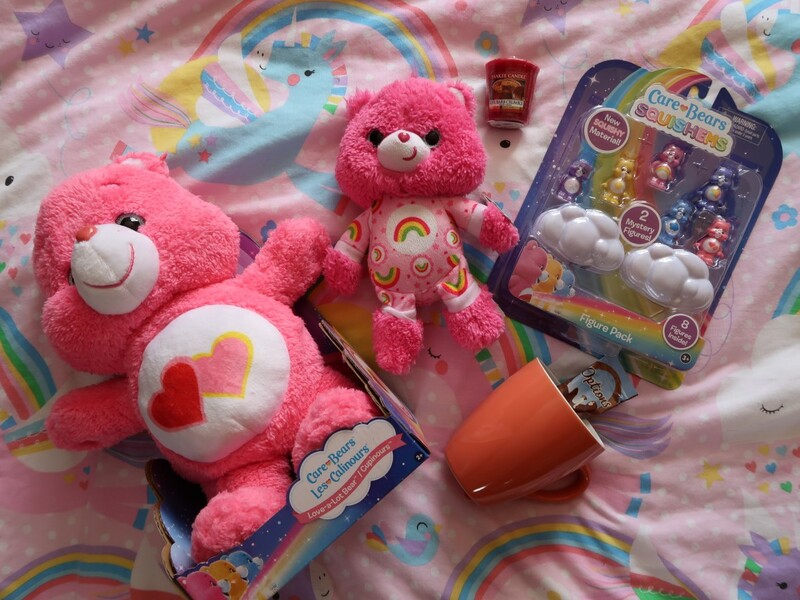 The Care Bears plushies are our favourites, they are so snuggly and make me smile. 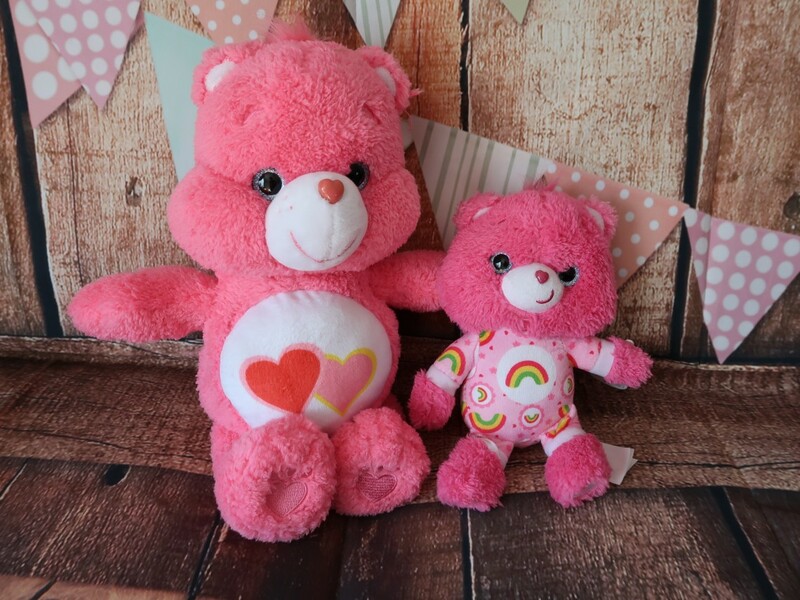 The Care Bears Medium plush which is the larger of the two pictured here is 13″ high and highly cuddlable. She is adorable. Make of bright fabric and they now come in Care Bear Cousins too. They have an RRP £15.99 and available from Asda, Tesco, Amazon and Debenhams. Love A Lot is perfect for hugs and making you feel better. 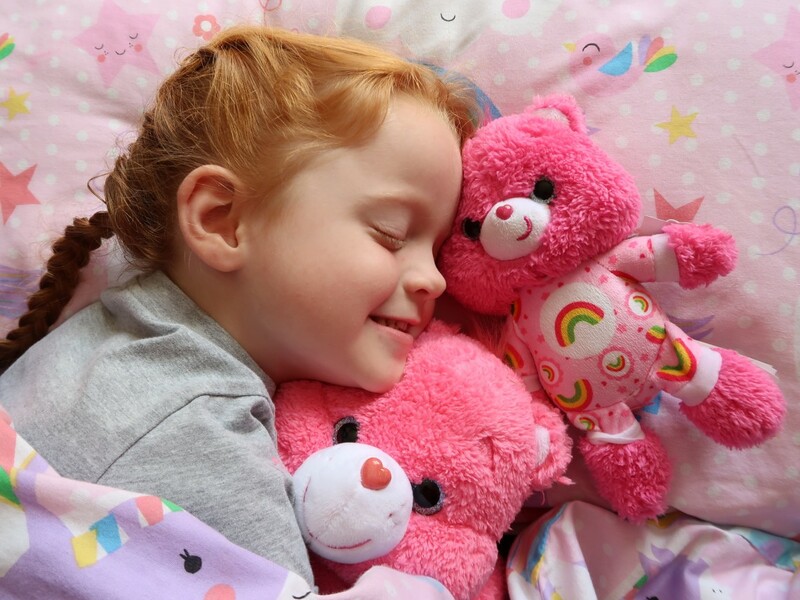 The Care Bears Cub is 8″ tall and comes wearing super cute pyjamas with their trademark belly badge on their pjs. 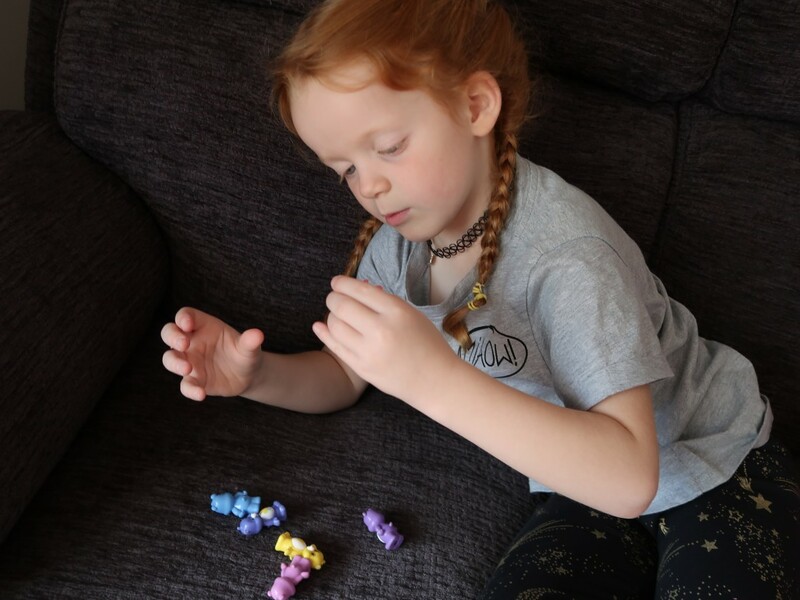 They are soft and a great size for younger fans. I think she’s particularly cute with her cheeky little smile. She is one of my faves. This particular one comes in 4 different characters, Bedtime Bear, Good Luck Bear, Love-a-Lot Bear and Harmony Bear. They are sold from Asda and Amazon with an RRP of £7.99 which I think is a great price. 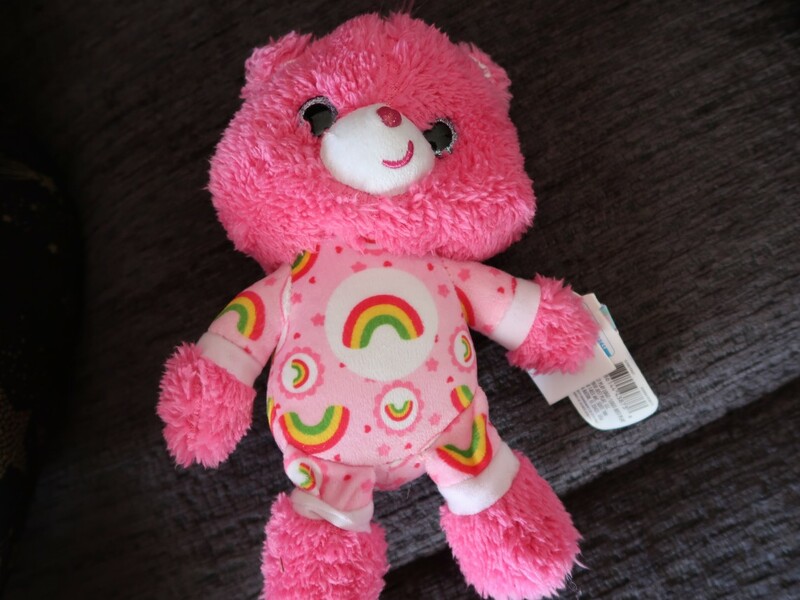 Part of this new range is Care Bears Squishems. These are adorable. I remember having a lot of fun with the little plastic figures of the Care Bears, I played for hours with them. 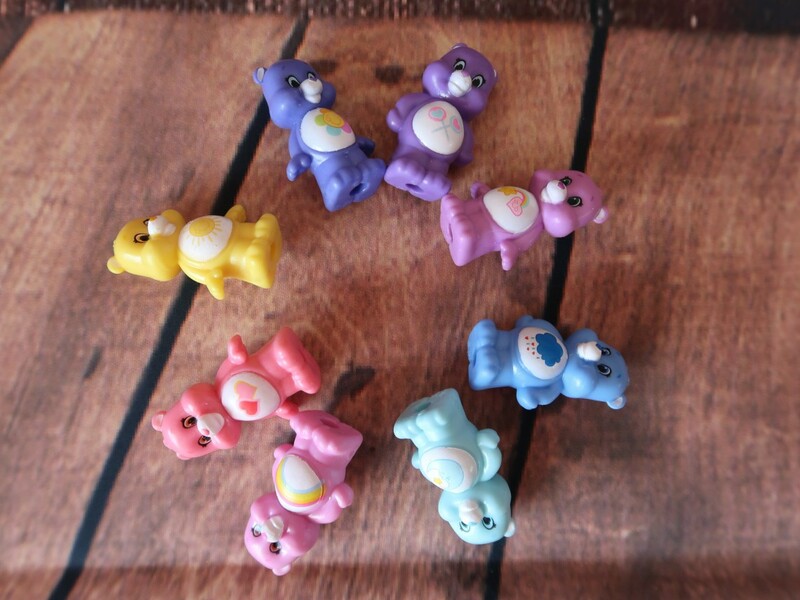 The new squishems pack has 8 squishy Care Bears in total. 6 of them you can see from the packaging and there are two mystery ones hidden behind two clouds in a blind bag type affair. We got a lovely selection of Care Bears. All familiar faces and adorable each and every one. They would be perfect for any Care Bear fan, young or old. There are a wide to collect. Perfect for little hands to play and role play their Care Bear adventures. I just love these and it was such a joy to watch Aria play with them. They would even look good on display on a shelf in a room. They are from Amazon and at £14.99, I think these are great value and would make a great gift. Aria and I absolutely love the Care Bears, she knicked my socks, but don’t worry, I kept some of the squishems and large Care Bear to myself. I’m not sharing them, they are too cute. It’s time to Take Care of Yourself and do that with Care Bears. 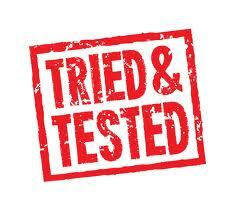 These are a great range, one we both recommend and love the care package. You can’t, not snuggle up to these. They are so soft. Which one is your favourite Care Bear? Disclaimer:- I was sent through the items mentioned for the purpose of this review, but all thoughts and opinions are my own. What a lovely collection. I love the new squishy range, we all love a good squish. Fabulous idea to take care of yourself. I will definitely be purchasing some at the price for my little nieces this Christmas. Aw that looks like a very happy girl in the last photo. I loved Care Bears when I was little and I saw one in Tesco the other day and was tempted to buy it for me, they are just so cute. They are so cute! I never had a Care Bear as a child!